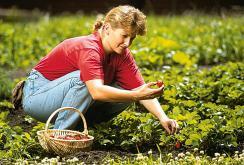 What makes Organic Gem® so good? Better ingredients make a better fertilizer. We start by using only FRESH FISH - providing you with the purest organic fish fertilizer on the market today! Our fish are deep-water bottom-feeders - rich in trace minerals and free from harmful coastal heavy metals. Our unique cold enzymatic process is strictly controlled for the highest quality in FDA approved facilities. We never denature the natural fish proteins or remove beneficial oils and collagen, providing you with all of the best ingredients. Organic Gem® is listed by the Organic Materials Review Institute (OMRI), one of the strictest organic review agencies in the country. It can be applied with no worries to human health and will not compromise local water supplies. The New York Botanical garden uses only Organic Gem on its roses. Read the article here. Watch Organic gem growing beneficial microbes under a microscope! Video courtesy of Tim Wilson. 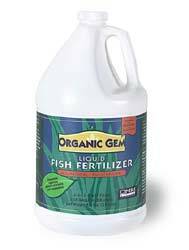 Organic Gem® Liquid Fish Fertilizer provides superior . . . Gives long lasting results with improvements in plant color, overall health and tremendous growth. Soil qualities are improved for deeper rooting and better penetration of water and nutrients. Unproductive soil is can be rebuilt and replenished. Promotes the growth of bacteria and other organisms as well as providing supplementary macro and micro nutrients. Simply the best fish fertilizer there is. It's easy! Order yours today.